Photo: Kent Pierce. Click on photo for original. 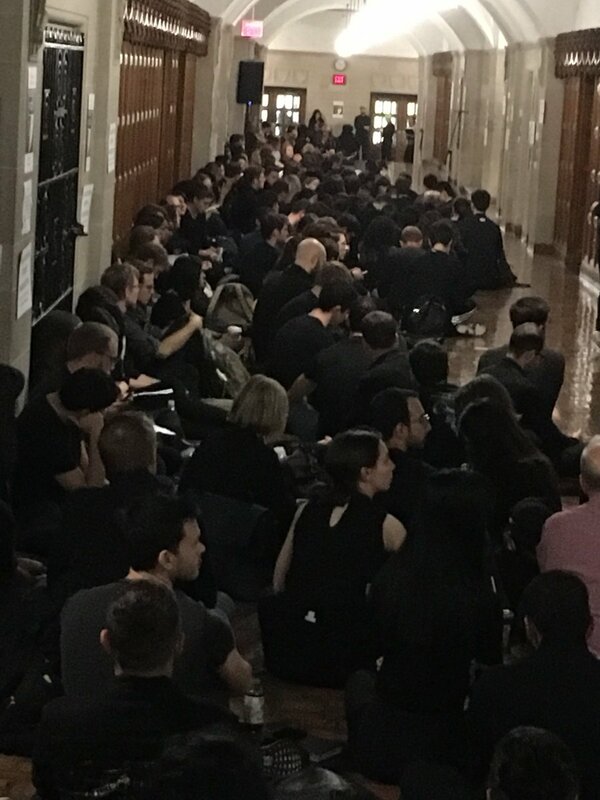 Half of the student body at Yale Law School held a sit-down strike in university hallways and refused to go to class on Sept. 24. These 250 students, along with a delegation of another 100 students who attended a major rally in Washington, DC, were protesting the Republican Party’s push to expedite confirmation of Supreme Court nominee and Yale alumnus Brett Kavanaugh. The strike was called after a Sept. 20 organizing meeting about Kavanaugh had evolved into a discussion of the law school’s overall culture of silence and its possible complicity in referring students to become clerks for federal appeals court judges who would then harass them. One such judge resigned last year after a dozen women spoke out against him. As for the current nominee, female students anonymously quoted by The Guardian spoke of private remarks by two Yale professors that you had to have a “certain look” to work for Kavanaugh, and “it’s no accident his female clerks look like models.” Yale has suspended one of the professors and is conducting an investigation. This entry was posted in Alerts & Appeals, Articles and tagged Brett M. Kavanaugh, Buddy Bell, student sit-in, Yale Law School. Bookmark the permalink. ← September-October 2018 issue of News & Letters is now online!